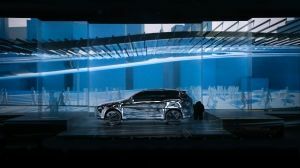 When Volvo unveiled the XC90 in Stockholm late last year it tasked Lightland AB with projection mapping the rotating vehicle for the automaker’s keynote presentation to the press. Working with video consultant studio BAJT, they relied on nine media servers from d3 Technologies to map the new car with blended real-time imagery from three different projectors, with another twelve projectors for all and floor scenery. One of the three projection angles used during the Volvo XC90 presentation. The visuals supported the speakers and explained new design elements, technical features and safety-related aspects of the XC90 in a fun and efficient way. A+A Communications in Gothenburg, Sweden produced the show; content was created by Edithouse and Lightland was the technical designer and supplier. Dandelion & Burdock did the template unwrapping of the car and the scenery models and installed the project onsite. The team deployed nine d3 media servers. “Since we were projecting onto a rotating car from three different projector positions we needed a system that handled real-time mapping onto a moving object and at the same time dynamically recalculated the blend among the projectors,” Studio BAJT’s David Bajt explains. Another angle showcasing the visualization work done facilitated by d3 Technologies.